Area farmers visited representatives in Washington last month. Left to right on the couch are Gene Daniel, Seneca County Farm Bureau president; Seth Middleton, Shelby County Farm Bureau president; John Hafer, Marion County Farm Bureau president; and Gary Mescher, Mercer County Farm Bureau president. 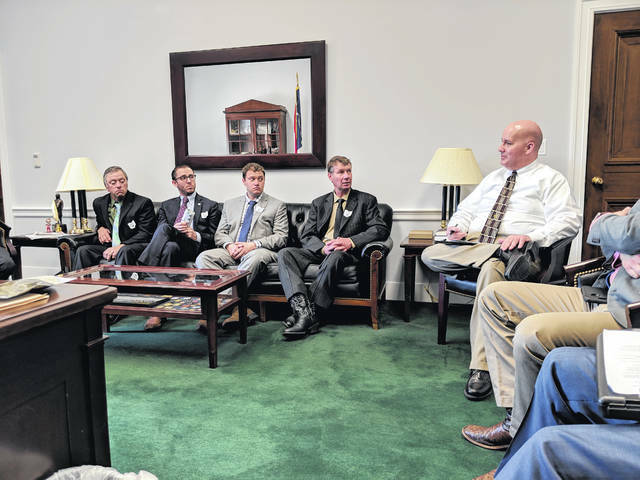 They spoke to Jared Dilley, in place of U.S. Rep. Jim Jordan, R-Urbana, during the 73rd Ohio County Farm Bureau Presidents’ Trip to Washington, D.C., on March 14. WASHINGTON, D.C. — More than 100 Ohio Farm Bureau members, many of them farmers, visited Capitol Hill to speak with their district representatives March 12 through 14 as part of the 73rd Ohio County Farm Bureau Presidents’ Trip to Washington, D.C.
Every year Ohio Farm Bureau takes Ohio County Farm Bureau presidents and vice presidents, along with a group of media, on a three-day trip to advocate to legislature. Gary Mescher, OFB County president of Mercer County and a dairy farmer, spoke with Rep. Bob Latta of Ohio’s 5th congressional district during his congressional visit on Capitol Hill, in addition to Jared Dilley in place of Representative Jim Jordan of Ohio’s 4th congressional district. He said that meeting with Latta went well, adding that “Mr. Latta was very receptive. He listened to all of us. Unfortunately, he had a vote, but that’s his job,” referring to Latta having to end the meeting to vote. “[LEBOR] has given people the right to just legislate things that will put agriculture or other business out of business. Especially when these same people are not playing by the same rules,” he added. Mescher said he asked Latta if he thought LEBOR and the water quality law suits were unconstitutional. Latta said that he doesn’t see how it stands up constitutionally. “I also am very concerned about trade. I agree with the tariffs. I don’t like them, but we have to do what we have to do,” Mescher said. Latta and the Farm Bureau members who met with him talked about broadband, saying that, “It would be nice to use all that technology,” referring to the farmers who do not have fast enough internet connection to use farm machinery that depends on strong internet connections. The attendees had breakfast U.S. Sen. Sherrod Brown, D-Ohio, on March 13 and U.S. Sen. Rob Portman, R-Ohio, on March 14. Both senators talked about their agricultural concerns, some including broadband, trade and the division of the U.S.
Brown told the group about a recent trip he took to Iowa. “We went to a lot of smaller places; we didn’t spend a lot of time in Des Moines. I heard a lot of the same concerns in Iowa that I hear from Ohio farmers. But maybe the biggest takeaway I heard was that just like in Ohio, these small towns feel overlooked and ignored,” Brown said. Portman said that his biggest concern is trade, adding that he has learned a lot about agriculture while working on trade issues. “Trade and agriculture are so close,” Portman said. Although Portman and Brown work on several Ohio agricultural issues together, they have different viewpoints on issues, such as taxes and climate change. Portman said that he talked to some small businesses benefiting from a little bit of a tax break from the Tax Cuts and Jobs Act passed at the end of 2017. However, Brown said that “the tax cut went to no one in this room but to the 1 percent,” said Brown, speaking to the group during his breakfast.